Q: Our son has food allergies, peanuts, dairy, and gluten. It’s bad and it’s a pain, but we manage. We cook a lot at home and we know which treats he can eat. I send him to school and friends’ houses with his own cupcake when there’s a party; but Halloween is tough. He loves the costuming but he can’t eat much of what he gets. It’s a bummer. Sometimes people get offended when he’s picking through their bowl. They think he’s being greedy, looking for a “favorite,” but actually he’s just looking for something he can eat. If someone tries to call him out on it I get hurt and angry. Any suggestions on how to keep the holiday joyful? A: Great question! 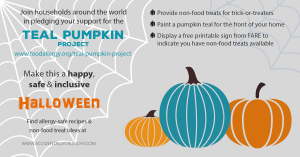 Enjoying Halloween with food allergies takes a little creativity. Here are a five suggestion to consider. First, be proactive. Have a pocket full of special-but-safe candy to eat along the way incase friends are dipping into their buckets before you get home. Second, advocate for your son, or teach him to advocate for himself, with a simple request such as, “I have allergies, can I pick out my own candy?” Third, consider making trick-or-treating into a game. Assign points to different candies. Then allow your son to cash out his candy for special toys that are waiting at home. Or cash out for a trip your favorite allergy friendly bakery (like the Red Bandana in Bethesda) or an afternoon at Rock’in Jump or Sky Zone in Gaithersburg or even a skydiving experience at the new iFly in Rockville if he’s the adventurous type (min age 3!). Fourth, get “un-food” focused. 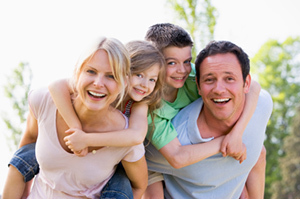 Spend time together as a family decorating your home for your visitors. Since your son gets excited about his costume, try focusing more on the fun of planning, choosing, and buying or making his costume. Meanwhile downplay the sweets aspect of Halloween. Some kids even prefer to pass out candy rather than walk the streets. 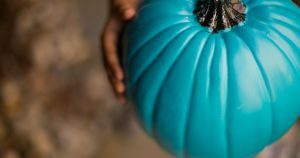 Fifth, Food Allergy Research and Education (FARE) has started the Teal Pumpkin Project to raise awareness about food allergies and Halloween. There’s a lot of cool information on their website ranging from non-food ideas and free resources about the movement. They also have a map of houses that participate in the Teal Pumpkin Project. Essentially these houses will either have a sign or a teal pumpkin indicating they have non-food treats for trick or treaters. Kentlands Psychotherapy sponsors a Teal Pumpkin (Haunted) House at 110 Treehaven Street. Perhaps you can become a Teal Pumpkin House as well! Whatever you decide, give yourself permission to think outside the box and start some fun new traditions while keeping your son safe. Happy Halloween!